The other day, I happened to notice a book on a library shelf that was about Starbucks and what it says about our culture. I didn’t have time to look at the book much, but I got the impression that the book was mostly concerned with the topics of economics and business. It looked like it discussed aspects of consumerism and marketing from the perspective of one ubiquitous company and then explained that the experiences of that business are representative of the way our economy works, on the level of individual consumers and individual products. If my impression of the book’s subject matter and tone was correct, it probably discussed the value of coffee only in terms of supply and demand, and not in terms of what coffee means to people in a more abstract and personal way. It got me thinking about what the coffee industry says about our culture if you leave the economic and commercial details out of the equation. When I was little, I mostly associated coffee with my father, because he was the only one in the household who drank it. I remember a few occasions when he let me take a sip, and I thought it tasted pretty disgusting. My mother drank a hot beverage made from a mix that was something like hot chocolate and something like instant coffee. 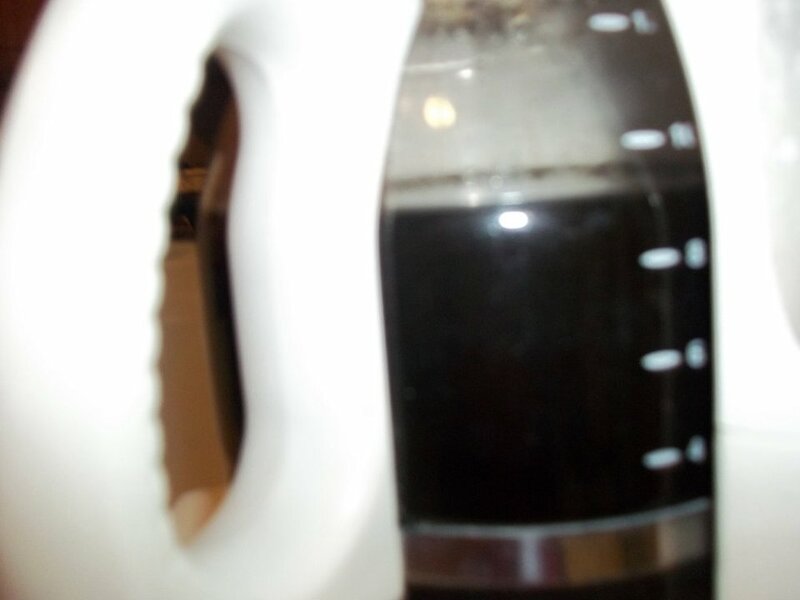 She called it coffee, but it was clearly a very different type of concoction from the bitter-smelling black coffee that my father made in his coffeepot. Although I don’t specifically remember it, I’m sure I also saw people drinking coffee before church on Sundays and at other church events. I do remember one time when I had a rather disturbing dream in which a member of the congregation randomly turned into a giant mug of coffee. Before I drank coffee myself, my connotations were very different from prevalent cultural images of coffee. My father would drink coffee while sitting at the dining room table, or he would have it in his hand as he left the house in the morning. I’m not sure if I was aware that there were such things as coffee shops, that some people liked to go drink coffee from paper cups in public places that had a specific ambiance revolving around the personality and attributes of coffee. That idea would have puzzled me. I also don’t think I knew when I was little that coffee is characteristically high in caffeine and that the acquisition of the caffeine is the primary reason for drinking coffee. All of the things that people say half-jokingly about the necessity of coffee were lost on me when I was little. 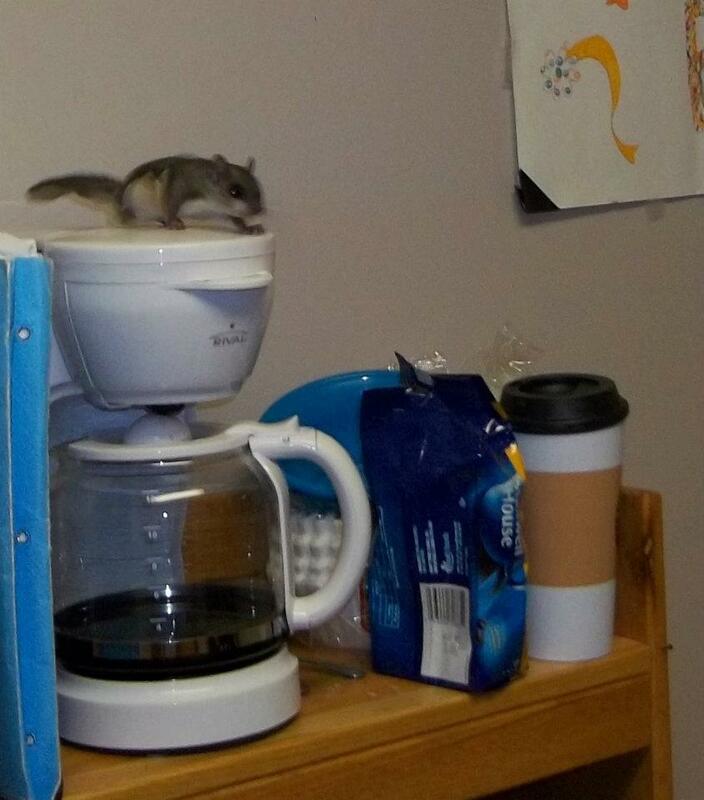 Remember that time when a flying squirrel got in my dorm room and I got a picture of it on the coffee machine? Ah, good times. I myself started drinking coffee in my sophomore of college. 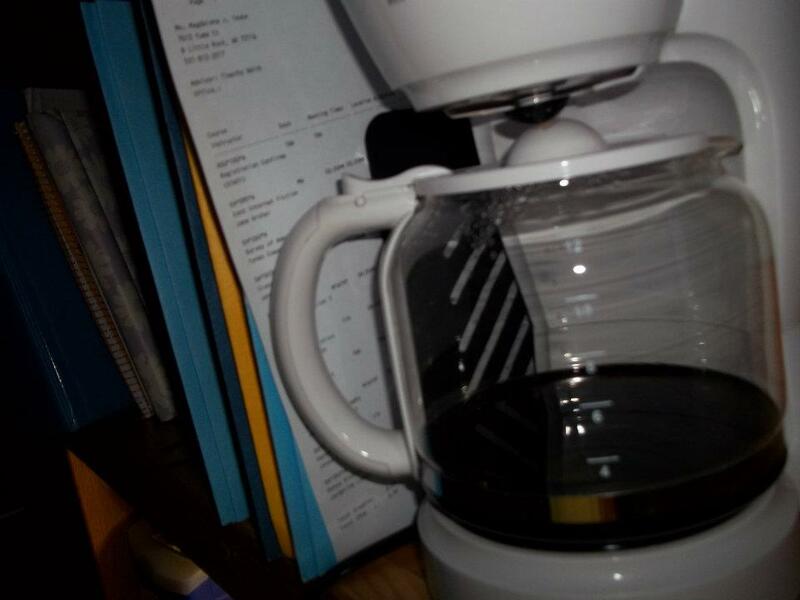 At first, it was a strategy for coping with a busy schedule on Wednesdays, but as it turned out, I really loved coffee. Back when I only drank one cup of coffee a week, that was one of the highlights of my week, and it didn’t take long before I increased my coffee consumption, first to twice a week, then to three times, and then to every day. Now, I drink a cup of coffee every morning and often will have a second cup later in the day, especially on evenings when I have class. I’m actually starting to get to the point where I don’t like it anymore; I just keep on drinking it for the caffeine. My brain runs on caffeine. You could say that I’m addicted to coffee, but you could say that about a significant portion of the population of this culture. Our culture puts a lot of emphasis on coffee. The first of those three reputations is the one that I relate to most, and the one that I hear people talk about most. 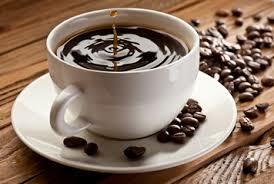 Very few people drink coffee because of the flavor; we drink it because it makes us alert. Twenty-first century Americans need help being alert because we live an exhausting lifestyle. For one thing, hardly anyone actually gets eight hours of sleep every night. Why go to bed when we can just turn on the conveniently electrical light, and there are so many things that we can do with that extra time? But besides that, we spend a lot of time staring at computer screens, which actually tires people out just as quickly (although for the opposite reason) as physical labor. Our not-so-distant ancestors who worked in the fields or built railroads had a better excuse to be tired than we do, but we are subject to fatigue anyway. Our culture also has an obsession with speed and instant gratification, which means that most jobs (as well as non-job-related tasks) are fast-paced, and that makes us collectively stressed. I think that some people exaggerate the effects of this, but it’s definitely true to some extent. (Just don’t go complaining to those aforementioned ancestors, because we sure have things easier than they did in most respects.) Even without taking into consideration the fact that caffeine is addictive, we need caffeine in order to live our exhausting lifestyle. Among people of my age and somewhat younger, the second of those three aforementioned perceptions seems to be the most prevalent and the one that contributes most to the popularity of coffee. At least among consumers in their late teens or early twenties, coffee is supposed to be associated with calmness and comfort, like the leisure of having free time and using it to read a good book, or the sensation of being safe and cozy inside on a rainy day, or the sound of James Earl Jones’ voice reading John 1 played over Mannheim Steamroller’s Christmas Lullaby. People, especially in a relatively safe and affluent culture, have a craving for comfortableness, a calm and easy lifestyle, and the illusion of security that comes from placing those connotations onto something as simple and easily achievable as coffee. Of course, that falls apart when people get snobbish about their favorite brand of coffee, especially when their brand of coffee is expensive and rare. Oh self-entitled coffee-obsessed hipsters, we’re just trying to appreciate and be satisfied with the simple joys of life, so don’t try to tell us that your simple joys are better than our simple joys. Incidentally, when you think about it, it’s kind of silly to associate coffee with calmness and relaxation, since that is the opposite of what caffeine does to our bodies. Both of coffee’s other two reputations, that of a benevolent deliverer of caffeine and that of a harmful chemical, are much more self-explanatory and accurate. It is true, though that, coffee is usually served as a warm beverage, and people experience warm beverages as being soothing. Tea and hot chocolate are also warm beverages, with a much lesser amount of caffeine, but I guess we prefer coffee as our go-to comfort drink because it’s something that so many of us drink on a daily basis anyway. So what does our relationship with coffee say about our culture? It says that we live busy and tiring lifestyles, hence the need for so much caffeine. It says that we feel an emotional need to be comfortable in our everyday lives. But I think that mostly, it says that, as a collective group, we’re kind of obsessive when we decide that we like something. It’s horrible just how many all-nighters I’ve pulled this semester. What makes it even worse is that the real reason this is necessary is just that the middle of the night is the only time I can get a moment’s quiet. My life is essentially characterized by an incessant cacophony of train whistles, airplanes, sirens, people’s voices, lawn mowers, leaf blowers, running faucets, hair dryers, loud footsteps, and slamming doors. The lawn mowers are the worst. The train whistles are really high on the list, too, and they unfortunately are the one that is still present in the middle of the night. But at least the noise level goes down enough that it’s technically possible to get work done, which simply isn’t true during the daytime. So I’ve gotten into the habit of pulling all-nighters at least once a week, and I think I’m actually in danger of literally going insane. If for no other reason, I’m looking forward to graduation because after that, I’ll be able to sleep occasionally. As long as I’m going to be up all night, I decided that this would be a delightful opportunity to do my laundry. Once upon a time, (until about a month ago, in fact) Saturday mornings were laundry time, but now the universe is falling apart and laundry time has become a movable occurrence. I cannot shake the conviction that Monday night is not a time during which one really ought to be doing laundry, but the fact of the matter is that I didn’t do laundry last Saturday morning because I really, really didn’t feel like it, and so it is necessary that I do laundry early this week. So I put my laundry in a laundry bag and headed to the laundry room, only to find to my dismay that washer number nineteen had someone else’s laundry in it. Now, there’s nothing particularly significant about the number nineteen, (in fact, I happen to intensely dislike the number nineteen) but there is something significant about washer number nineteen. That significant thing is that I always use washer number nineteen. Except sometimes when it’s full of someone else’s clothes, and so I use washer number seventeen instead. But this time, washer number seventeen had someone else’s clothes in it, too. I settled for washer number seven, but this is not the way it should be. This is an even greater problem than the new uncharacteristically mobile nature of laundry time. In fact, the horror of this situation is comparable (although still significantly less) than the trauma of finding someone else in my favorite parking space. For the record, I am a Lutheran and a ballet dancer and I’m OCD which means that nobody had better take my parking spot. When they do, bad things happen, and considering that I’m the one to whom they happen, other people don’t necessarily have an incentive to stay away from my parking spot, which is really a problem. Granted, my parking spot has only been taken from me once in the last several months, but it was a very traumatic experience and will probably haunt me for as long as I live. Cups of coffee: Technically still one. I just poured the second cup. This is a book I greatly enjoyed, and its title is very relevant to my life at the moment. I have no idea what has happened to the last three hours. Well, actually I do; they were killed by homework, a fate which I fear I may end up sharing. But while they were in the process of slowly and pitifully losing their battle against the overwhelmingly powerful army of my math homework, I was not aware how many of them had fallen. And now the three of them lie lifeless on the battle field, and I sadly stand here staring at their remains and thinking of all the potential they had. I could have used those three hours to read interesting books or to write Doctor Who fan fiction or to play many games of Settlers of Catan or to do any number of other delightful things. But instead, they gave their lives so that I might do my calculus and linear algebra homework, and indeed, they died in vain, for I still don’t understand math. Over the course of this semester, there have been times when I’ve hated calculus but been okay with linear algebra, and there have been times when I’ve hated linear algebra but been okay with calculus. At the moment, I’m not on very friendly terms with either of them. 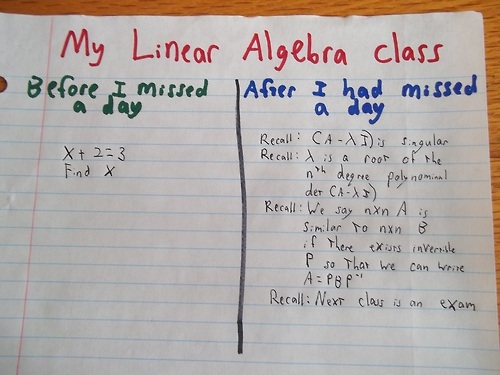 But if I had to choose one as a favorite over the other, I’d go with linear algebra. In calculus, I understand the concepts, but I somehow invariably get the wrong answers anyway, and I have no idea why. In linear algebra, I don’t really understand the concepts, which completely explains why I’m not always getting the right answers. It’s a much less frustrating situation, because it implies the possibility that there shall be a time in the future, perhaps the very near future, that I will understand the concepts and will find correct answers to the problems. Or maybe not. Because that’s just not the kind of thing that happens in my life. 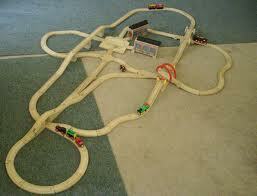 I got this picture from Google, but it looks a lot like the train tracks I remember from when I was little. arguments as they try to guess what exactly happened to me. I will become famous as the only person to have ever died of sheer annoyance. This was the episode I saw. They say that one of the main purposes of sleep- and of dreams in particular- is to organize and arrange new information. It’s an essential part of the learning process. Unfortunately, I’m too busy learning to sleep. This is a problem; college is making me stupid. Fortunately, I’ve recently come up with something that helps a little. Sometimes, watching an episode of Doctor Who is a reasonable substitute for dreaming. I tend to dream in Doctor Who fan fiction anyway, so the only actual difference is that it isn’t my own brain that’s making up this stuff. (Admittedly, that’s a pretty significant difference, but I don’t really have a better option.) Also, Doctor Who only takes about 45 minutes, while sleeping takes a few hours. And Doctor Who involves wearing earphones and deliberately blasting noises into my eardrums, which temporarily block out the train noises. (Which, unfortunately, I can now hear again. This is ridiculous; it’s been at least eight hours since they’ve been quiet.) In case it isn’t obvious by now, trains are not my friends. 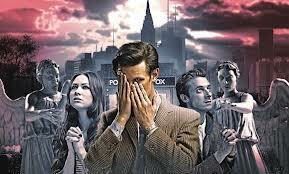 I prefer weeping angels. Maybe, when I go downstairs to get my laundry in just a minute, there will be weeping angels down there, and they’ll catch me and send me back to a time before trains existed. That would be nice. I have a theory. As you may have guessed, it involves trains. My theory is based upon two observations. For one thing, I don’t know where the train tracks are. In the course of my daily life, I drive a total of more than 200 miles each week, and I never ever cross train tracks. Yet these trains must pass quite close to where I am, since they’re so loud and disruptive. The other observation is that I rarely hear anyone else mention or complain about these trains. Instead, other people mention and complain about the birds. It’s true that the birds on campus are fairly loud and have a tendency to sing at all hours of the night. I’ve been hearing them for the past three or four hours now. 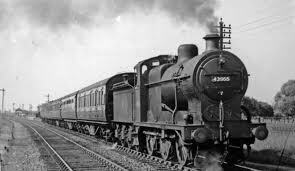 But I am very baffled as to why someone would be bothered by the sweet, melodious tunes of a little bird when they could be bothered by the loud, mechanical bellow of a train whistle. Evidently, other people simply do not hear these train whistles, which is quite odd, considering the fact that they are absurdly loud and unbearably frequent. So I ask myself, why is it that there are trains without train tracks, and that other people can’t hear these trains? The answer is obvious. Well, not really, but I’m going to go with it anyway. These trains exist in an alternate set of dimensions. They are evil interdimensional trains that cross the void into my own dimensions for the sole purpose of antagonizing me, and their whistles of doom have properties that pull IQ points out of my brain, depriving me of intellectual capacity. That’s why I can’t ever get stuff done adequately. Maybe I should explain this to all of my professors and see what they have to say about it. At last, there is some progress being made on my linear algebra homework. In fact, I have suddenly found that I’m nearly halfway done. That’s after working on it for the past nine hours, and it’s due in about five and a half hours. Um, never mind, I guess this isn’t such a good thing after all. Especially considering that I have other homework to do during that time, too. Meanwhile, the city has woken up and the train whistles have been joined by their friends, the ambulance sirens and a lawn mower. Meanwhile, I’m pondering how ironic it is that I once loved the song “I’ve Been Working on the Railroad”. On an unrelated note, I think it’s about time for me to take a short break to get breakfast and, more importantly, coffee. My question is what the trains want with my brain anyway. I mean, they’re presumably from some planet with advanced knowledge and technology; otherwise, they wouldn’t be capable of mind theft. I doubt there’s any information in my brain that would benefit them in any way. Even I am not quite paranoid enough to imagine that an alien race would do things to mess with my mind for no other reason than to be evil to me. There must be some motive. If I can come up with a good one, this could be the basis for a decent science fiction story. I would call it “Train of Thought”. I posted this on tumblr the other day for the purpose of complaining about math. I was finally starting to think I was actually going to get this algebra homework done, and even have a couple of hours to spare for other stuff, like, you know, calculus or something. But this last problem clearly just isn’t going to happen. I hate eigenstuff so much because I have no idea what the camaduka any of it means, which probably is due to the fact that I was in Louisville, Kentucky, presenting a paper, during the time when the rest of my linear algebra class was learning what the camaduka eigenthingies are. Considering the fact that this was a couple weeks ago, you’d think I’d have caught up by now, but the book makes no sense and my notes from subsequent classes contain contradictions. I have come to the conclusion that eigenstuff, like trigonometric functions, have no purpose or definition and exist solely for the purpose of making mathematics more confusing. 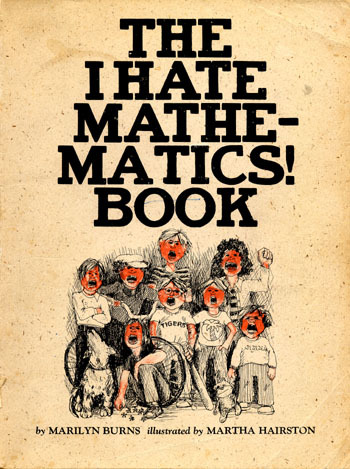 At some point, some evil genius realized that he was so much cleverer than everybody else that he could make up random things that sounded like math, and everyone would believe him, and some people would even pretend to understand it, just so that they could feel clever. And thus was born a branch of mathematics that doesn’t actually exist. Either that, or I’m too stupid to understand it, and I don’t like that theory much. The morning has more or less come to an end, and I’m about to go to class. Therefore, I shall now wrap up this blog post with the acknowledgement that I have succeeded in surviving one more night without having my brain taken over by a sinister extraterrestrial psychic train. I can still hear them even now, but their power seems to be diminished slightly in the daytime, or maybe it’s just that I can’t hear them as clearly over all the daytime noises. At any rate, the fact remains that I still have at least some remnant of my mind more or less intact. One more alien invasion survived. The pattern is now familiar. I make a list of homework and a plan of attack, I get some M&Ms and make some coffee, and I sit down in front of my computer to document my sleepless night by writing random and rambling things about it, which shall then appear on my blog for all the world to see. Generally, these all-nighter chronicles begin with a remark that I wasn’t expecting to need to do this. That is certainly the case in this situation; I really thought that this semester wouldn’t call for any all-nighters. Academically, this is the lightest semester I’ve ever had. But around midterms, there’s no such thing as an academically light semester. To be honest, this all-nighter probably isn’t necessary. I think that I could be ready to call it a night by about two O’clock or so. That’s really late for me, but it is much less drastic than pulling an all-nighter, especially since I don’t even need to be up at a reasonable time tomorrow. This semester, I only have morning classes on Mondays and Wednesdays, and tomorrow is a Tuesday. I prefer to be up at a reasonable time anyway, but I could make an exception to that habit if I felt it was necessary. But, after giving the matter due consideration, I decided to pull an all-nighter. That way, I have all the time I need and don’t have to feel stressed about finishing by a certain time. Besides, it gives me an excuse to eat M&Ms, and it makes it possible for me to take the time for Catan breaks. 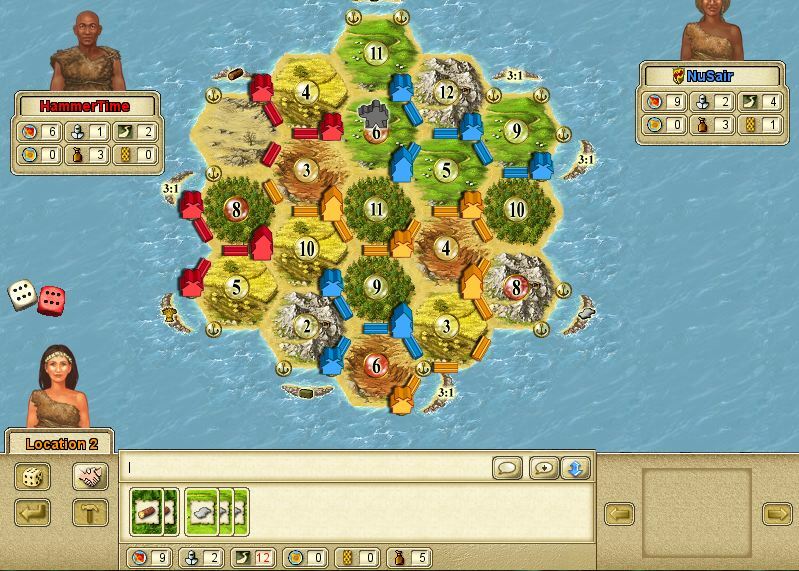 Anyone who has been reading my blog regularly may have noticed a bit of a pattern lately, which is that I have a tendency to mention Catan quite frequently. I didn’t win. Life is tough. Games of Catan: 1. I lost. It wasn’t fair. I totally should have won. I would say that I was making pretty good time, except that I’m supposed to have three pages of this paper done by midnight. That is, I’m supposed to submit a three-page draft online. Three pages really isn’t a big deal, especially because this draft isn’t going to be graded. The professor is just having us submit it to make sure that we actually have that much done. Originally, the paper was going to be due tonight, but now it’s due on Wednesday instead. Compared to certain papers from last semester, this will be quick and easy; it’s basically a paper on a project that was already presented in class today. But I’m a very slow writer. For me, any paper is a long paper. That’s a little ironic, considering just how much writing I do, even outside of schoolwork. I’m also very slow at math. I’m slightly proud of myself for being done with my calculus homework for tonight, even though it was a pretty easy homework assignment. It was on the partial derivative. Partial derivatives are pretty simple. Incidentally, I really don’t seem to have many yellow M&Ms here. That’s a little odd. Games of Catan: Still just one. I still think I should have won. An incredible and very good thing as happened. As I logged onto the thingy to submit my paper draft, nothing went wrong. This is rare indeed. My college’s internet system doesn’t like me; whenever I try to log into something that’s through the college, it won’t accept my password the first few times I try. Sometimes, I keep on trying over and over and over and never even get in because it eventually blocks my access because of so many failed attempts to enter the password. This is extremely frustrating. But it didn’t happen tonight, which is good because I submitted that draft at 11:54, which was cutting it pretty close. The uncool part is that it’s a pretty lousy draft, but that’s not a big problem. I still have two days to finish it and clean it up, and I’ll probably be able to dedicate a significant portion of tonight to it. But I do have to concentrate on my algebra homework for tomorrow first. Here’s why the number of green M&Ms isn’t a whole number. Games of Catan: Just one. I really want to play another one now, but it isn’t time yet, according to my detailed plan for tonight. Normally, whether I’m staying up all night or just staying up really late, I don’t actually leave my room in the middle of the night. Tonight was an exception, though, because the aforementioned computer assignment for linear algebra required a computer program that I can only use on the computers in the math building. 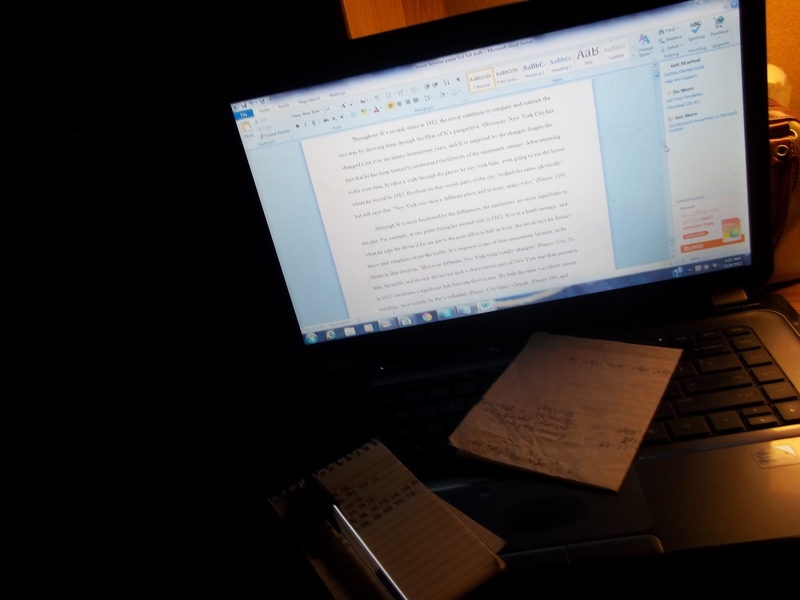 So I headed over there a little after midnight and spent about an hour and a half on that assignment. It was weird being outside at that time of night; for once, it was quiet. There were a few people in the math building, because that happens to be a favorite late-night-studying place and all-nighter place. The assignment in question was actually pretty cool; it had to do with ciphering. I made a slight mistake on a cipher that I was supposed to be deciphering, so it came out correct except for one word in the middle, which said ‘rMOk’. This amused me greatly. But I redid the exercise anyway, and it came out with real words that time. I couldn’t quite figure out how to do the last exercise, though, so I’ll have to do that one later. I’ll probably do it right before class, because that’s the only way I’ll have a chance to ask the professor about it. Games of Catan: Still just one. But the time for game number two is near at hand. First, I have some algebra homework to do, but Catan is next after that. 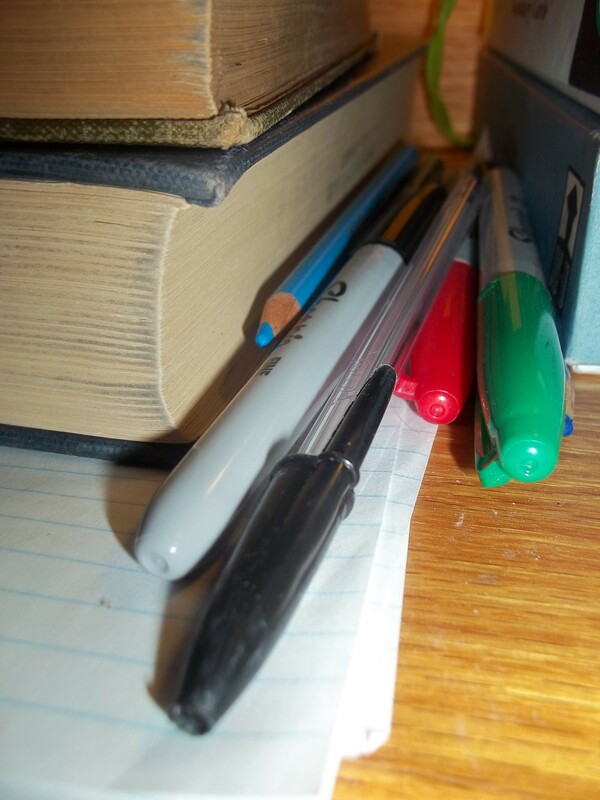 There are five greatly awesome things that are within inches of my hands right now, all of which I have used quite a bit within the past few hours. The list is as follows: coffee, M&Ms, colored index cards, sharpies, and dry erase boards. A few minutes ago, I was surprised and confused to discover that my fingers were speckled, but a moment’s reflection enabled me to realize that this was because I had been using my fingers to erase numbers off of my dry erase board in order to replace them with other numbers. I love using dry erase boards to keep track of random and inconsequential details of my life. ‘Tis an entertaining thing to do. 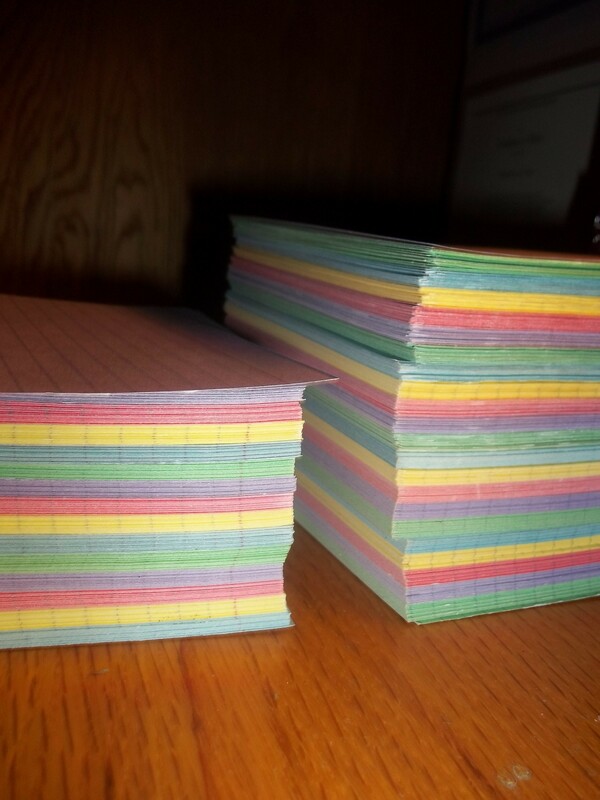 The appeal of colored index cards and sharpies, of course, is that they allow you to color code stuff, and color coded stuff is automatically cooler than non-color coded stuff. As a matter of fact, this point also can be extended to explain the coolness of M&Ms, and to relate to my interest in keeping track of M&M colors on my dry erase board. But coffee isn’t colorful. The coolness of coffee is independent of its visual appearance. Maybe someone should invent colored color-coded coffee. By definition, that would be incredibly cool, but I can’t actually think of a good purpose for it. I’ll have to think about this. Homework done: See above, plus just a couple algebra problems. But those couple that I did took a really, really long time. Games of Catan: Two and a half. The website’s down, so that last game was aborted. That’s okay; it was making me really mad because I was losing really badly because nobody was rolling fours, sixes, eights, or nines, which just shouldn’t happen. People were basically just rolling tens every single time, which was very much in orange’s favor and did me no good at all. It was really unfair, especially since I had had a very similar problem in the previous game. Sometimes I wonder if other people have discovered ways to rig the dice on internet board games. It seems feasible, since those are just imaginary dice anyway. Presumably, if someone was really good with computers, they could figure out a way to trick the system. I’m not necessarily saying that’s what happens, I’m just saying that it sure seems like it. Aside from the Catan problems which I have lamented in the previous paragraph, I’m also frustrated that this algebra homework isn’t going well. I still have several hours before class, but I don’t want to spend that entire time on this one homework assignment. At the rate I’m going, that’s how long it’ll take. The weird thing is that it’s almost morning now, and it really doesn’t feel like it’s been that long since I got back from dance class at around eight O’clock. It’s no wonder I always feel tired; apparently nights go faster than days, and so one doesn’t get a lot of sleep by sleeping through the night. But it wouldn’t be any better to sleep during the day, since I have just determined that nights aren’t long enough for doing homework. The only solution I can think of is that days just need to be longer. Since the length of a day is determined by the amount of time it takes the Earth to revolve around its axis, we just need to slow the Earth’s rotation. I wonder what kind of an impact this would have on the Earth’s climate. Of course, in order to minimize these effects, it is important that the Earth’s orbit around the sun should not be changed at all. I think years are a pretty good length. Although it would be nice if the number of days in a year was something a little nicer than 365 ¼. That’s such a random number. I would like to suggest 350. That’s close enough to the current year length that it wouldn’t make a big difference, but it’s easier to remember and it has more factors than 365 or 366. We could divide the 350-day year into ten months of 35 days each, which I think is a lovely length for a month to be, and ten is a nice number of months. And there will be exactly 50 weeks in a year, which would be convenient. It would also mean that holidays and birthdays would fall on the same day of the week every year, which is an appealing idea and would make it very easy to keep holiday traditions the same from year to year. And Advent would always be the same length, so Advent calendars could actually be Advent calendars instead of December calendars that call themselves Advent calendars. It would seem that I don’t feel like returning to my algebra homework. Between various math problems, you can see my M&M statistics. Cups of coffee: Three and a half. Now my coffee is gone, but that’s okay, because I’ll be able to go and get some more from the cafeteria in just a couple hours. It is worth noting that, on days when I sleep, I hardly ever drink more than one cup of coffee. 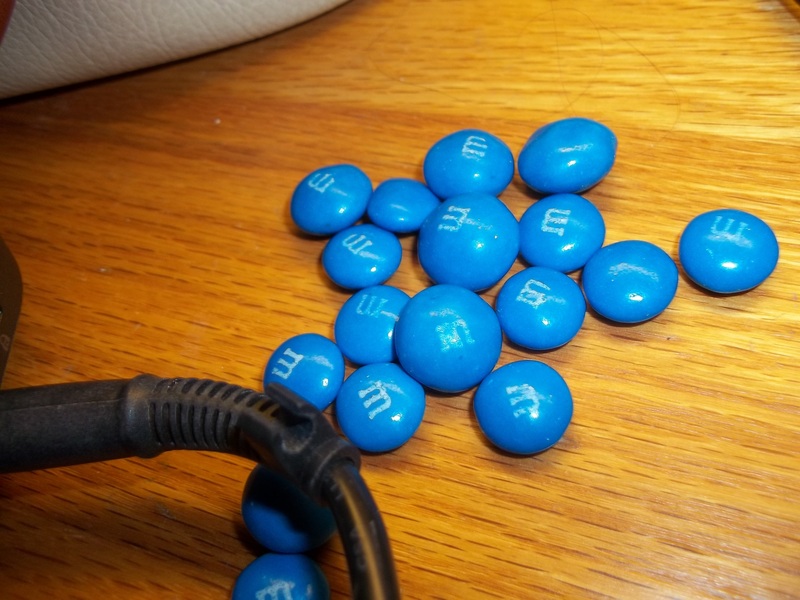 M&Ms: 43 blue, 22 red, 19 yellow, 24 brown, 38 ½ green, 26 orange. This is a final count; my M&Ms are now gone. Homework done: All I have accomplished since the last update was another couple paragraphs on that paper. Games of Catan: Two and a half. It’s still dark and will be for a while, but I hear birds singing. Some people on campus complain about how loud the birds are, and I am puzzled by their annoyance. 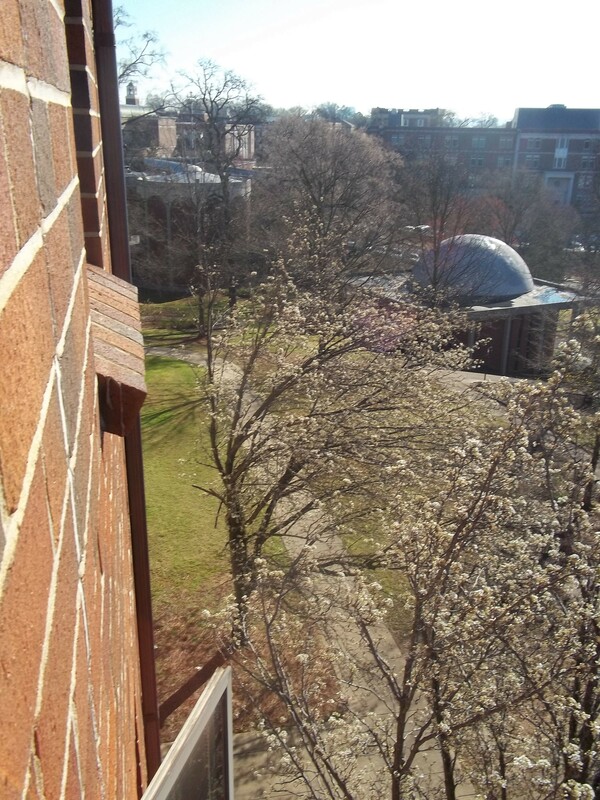 Personally, I don’t mind the birds nearly as much as I mind the leafblowers and lawn mowers, which are also noises that one hears almost constantly on this campus, and frequently right under one’s window when one is trying to do homework. I think I’m going to go take a shower now. After that, I have to get back to my algebra homework, and then I’m allowed to take a break to check tumblr. Cups of coffee: Still at three and a half. Homework done: See above, plus a couple more algebra problems. Games of Catan: Still at two and a half. I actually didn’t take a shower shortly after five, like I said I would, because my roommate was in the shower. In my residence hall, we have suites, and each suite has its own shower. I definitely prefer that to a communal bathroom, but it’s more than a little annoying hearing water running when I’m trying to do homework. It’s weird how some noises, like showers and squeaky doors, drive me crazy, while other noises, like ticking clocks and the strangely loud hum of my desk light, don’t bother or distract me at all. Right now, I’m a little annoyed at the world in general for the fact that it’s morning. I don’t know where all the time went last night. I was expecting that I’d get more done. Now I still have homework to finish and stuff to study for midterm exams later this week, but I have lost the quiet and solitude that the nighttime offers. Cups of coffee: A little more than three and a half. I just came back from breakfast in the cafeteria, and I brought back a cup of coffee with me. Coffee is good stuff. Homework done: None since I last gave an update, actually. Unless I’ve done a couple algebra problems since then. I can’t remember how many I’d done before that point. I’m still less than halfway done with what I have due today. 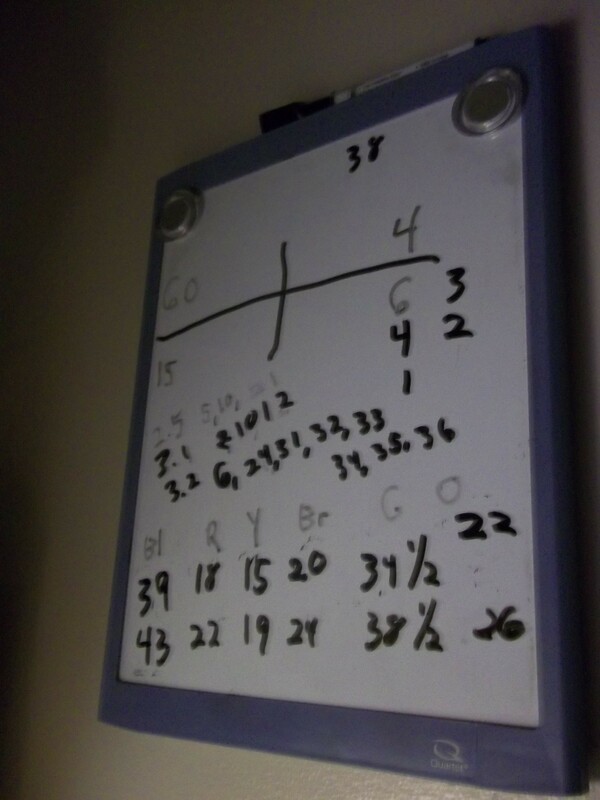 This is what one of my dry erase boards looked like by morning. Today’s sunrise was disappointingly nonspectacular, but that’s okay, because now that the sun’s up, it’s a really beautiful day. Maybe it’s a bit chilly, but it’ll probably be really nice in a few hours. Next on my agenda is the game I like to play where I use a random number generator to get twenty random digits and then try to memorize them in under a minute. Lately, I’ve only been doing this once a day. I’m on a good streak now, though. I’ve gotten a perfect score four out of the last five times. This may not be an achievement that means anything to anyone besides me, but I am rather proud of it. I just hope I can keep this streak going. Considering the fact that I haven’t sleep in over a day and I’m dead tired, my brain might not be at its best this morning, though. I really wish I was playing Settlers of Catan right now. And I really wish I was winning. Homework done: More algebra, but I’m still not done with today’s assignment yet. I am actually making progress; it just really takes that long. Seriously, math is hard. Games of Catan: Two and a half. But I’m getting close to my next Catan break. This excites me greatly. Here is a picture of outside, despite the fact that the picture doesn’t look as pretty as it really is. I just opened my window. It’s so ridiculously beautiful out there today. The thing about Alabama is that you never know from one minute to the next what the weather is going to be like. On Sunday, it was nice like this, but yesterday, it was gloomy and wet and rainy and just really ugly. But then it suddenly cleared up in the middle of dance class, very shortly before it got dark. And last night it was pretty chilly. As clear as the weather is now, there’s no telling whether it’ll rain again. For all I know, it could snow tomorrow. I’m trying to remember what I normally write in my all-nighter blog posts. I seem to recall that they aren’t normally about the weather, but right now, the weather seems to be the most noteworthy thing. I tried to take a beautiful picture from my window so that I could show the beautiful weather, but it didn’t turn out looking very beautiful because most of the trees still don’t have leaves yet. I’m guessing that will happen soon. Cups of coffee: I’ve stopped at four and a half. 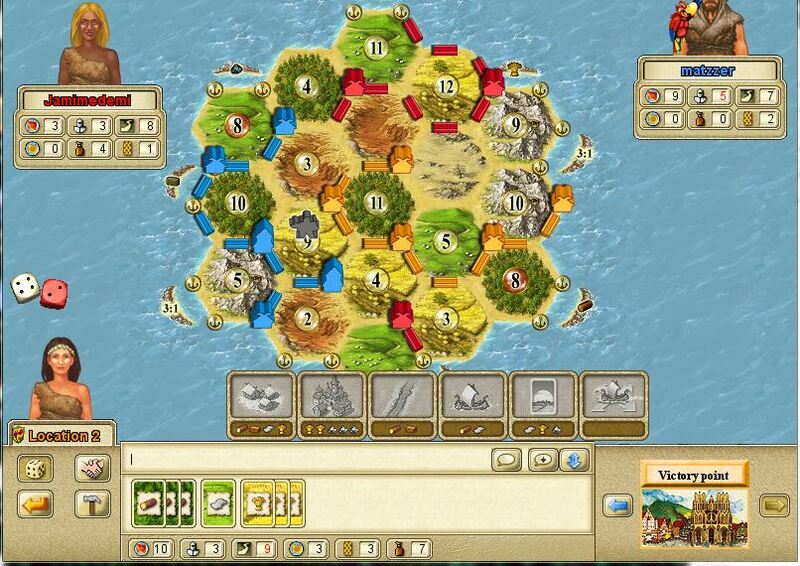 Okay, I admit it, I just played several consecutive games of Catan; I don’t even know how many because I lost count. Most of those games were ridiculously short because one person got all the luck and won before I’d even had a chance to do anything. It was getting quite frustrating. I mean, here I’ve been awake all night, working long and hard in an effort to learn stuff. I feel like the universe at least owes me a few lucky rolls. So I just kept playing until I finally won. And now, here’s what I’m going to do: I’m going to put this on my blog, then I’m going to finish my algebra homework (which is finally almost done), and by then, it’ll probably be about time for me to get all my books and stuff together, go to the cafeteria for lunch, check my mailbox quickly, and then head off to math class. This is where I’m starting tonight. I was kind of hoping that this wouldn’t have to happen this semester. After all, I got through two and a half years of college before I ever had to pull an all-nighter, and last semester was an unusual situation because I was taking an absurd number of classes. Nevertheless, despite the comparative ease of my schedule this semester, it has become necessary for me to stay up all night writing stuff tonight. Unfortunately, today is a particularly bad day for an all-nighter, and by that, I mean that I really don’t feel like it. I really, really, really don’t feel like it. The coffee maker is running and I have an enormous pile of M&Ms on my desk. ‘Tis time to get to work. It had been my intention to include my M&M count along with the coffee count, but I have eaten such a ridiculously large amount of M&Ms already that I don’t feel like releasing the exact number to the internet. 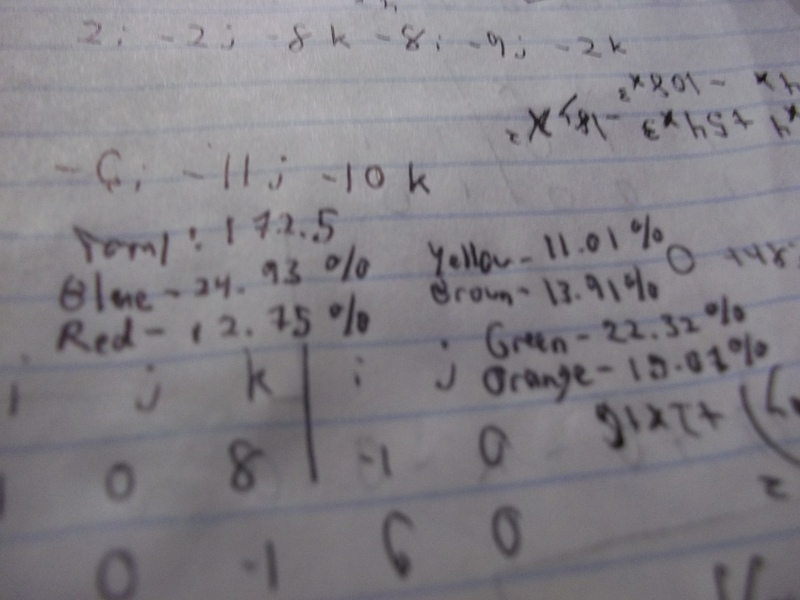 Nevertheless, it is worth noting that I have been keeping count, mainly for the purpose of calculating the proportion of each color. It has always slightly annoyed me that packages of M&Ms do not have an equal amount of each color. This is not the way it should work. Also, I have made some progress on my paper, but not nearly enough. I technically only have a couple pages left to go, but I also have several hours’ worth of editing and cleaning to do. And I have two papers due next week that I need to work on if I can find the time. In just a few minutes, November 7 will end and give way to November 8. At least, it will if we assume that the new day begins at midnight. My question is why we say that the new day begins at midnight. According to Jewish tradition, the new day begins at sunset, which is really convenient on Christmas Eve and the day before Easter when you don’t want to wait any longer before starting to celebrate the holiday. 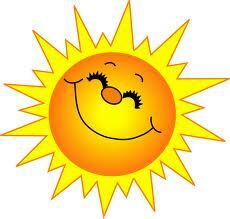 Actually, what makes more sense to me is to think of the new day as beginning when I wake up. But then, on a night like tonight when I don’t actually sleep, does that mean that the new day never actually begins? The answer to this question is obviously no, which is unfortunate because obvious answers abruptly kill the question. Ambiguous or conditional answers allow the question to live on, or at least to gently transition into another question. On an unrelated note, I think my M&Ms are going to run out before the nighttime runs out. Also, I think now would be a good time for a scrabble break. I’d better win. The joyous news is that my paper is now officially long enough. That is kind of a big deal because this is kind of a long paper. The sad part is that it isn’t very good; it’s still going to take me a few hours of work to make it semi-decent, and semi-decent is not the same thing as good enough. I don’t think this paper will ever actually be good enough because I tend to define good enough according to a pretty high standard. So I’ll just keep on editing it, rearranging things, adding citations, and adjusting my sentence structure and word choice until I run out of time, and then at least it’ll be as good as possible, even if it still isn’t as good as I’d like. Google tells me that today is Bram Stoker’s birthday. That’s interesting. Facebook tells me that many of my classmates are still awake. That’s not surprising. Tumblr tells me that many of my sisters are still awake. It’s amazing how much you can learn from the internet. Here is an interesting moral dilemma: When one stays up all night long, at what point should one brush one’s teeth? ‘Cause I haven’t yet brushed my teeth tonight. I’m thinking that I might as well wait until morning to do that. Here is another dilemma: Should I close my window? I want to leave it open, but it’s getting kind of chilly outside. And here is yet another dilemma: What the camaduka am I going to do about this stupid paper? I don’t like the way it’s going, but I’m already more or less done with this draft, so I can’t exactly just scrap it and start over. Even if I had the time to start over, I don’t have the motivation. I’m starting to wonder if I’m going to get much more done before I have to just go ahead and turn it in. On an unrelated note, I would like to point out the importance of sorting M&Ms according to color before eating them. This is very, very important. It is not important, however, to sort the milk chocolate ones from the peanut butter ones. They’re supposed to be mixed together. If they were meant to be separate, I never would have mixed them together in the first place. Alas, my coffee is cold. I don’t like cold coffee. I haven’t done the all-nighter thing many times because I don’t function well without sleep, but I have decided that I like the time of night when almost everyone is asleep and staying-up-late has officially transitioned into staying-up-all-night. It’s about that time now. Also, I like the part where I don’t have to wake up in the morning, because waking up just isn’t much fun. I’m not the biggest fan of sleep, but I really dislike waking up. How, you may ask, is my paper going? And I will tell you: the answer is, leave me alone, I’m working on it. Granted, I’m not working on it as efficiently or productively as I was a few hours ago, but I am working on it. 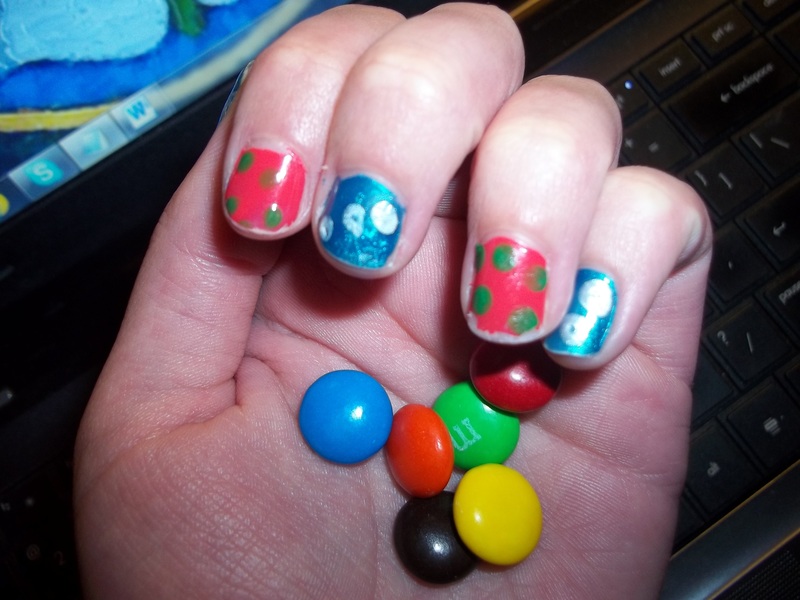 Here is my hand holding some M&Ms. Note how awesomely I painted my fingernails a few days ago. The coffee is gone, and at this point, I’m not going to make more. After all, it will only be a couple hours before it’s time for me to start my day tomorrow, and then I can have more coffee. Of course, that might not be the best idea after all the coffee I’ve just had, but staying up all night is tough. I kind of wish I’d been keeping track of how much writing I’ve done tonight, all totaled. 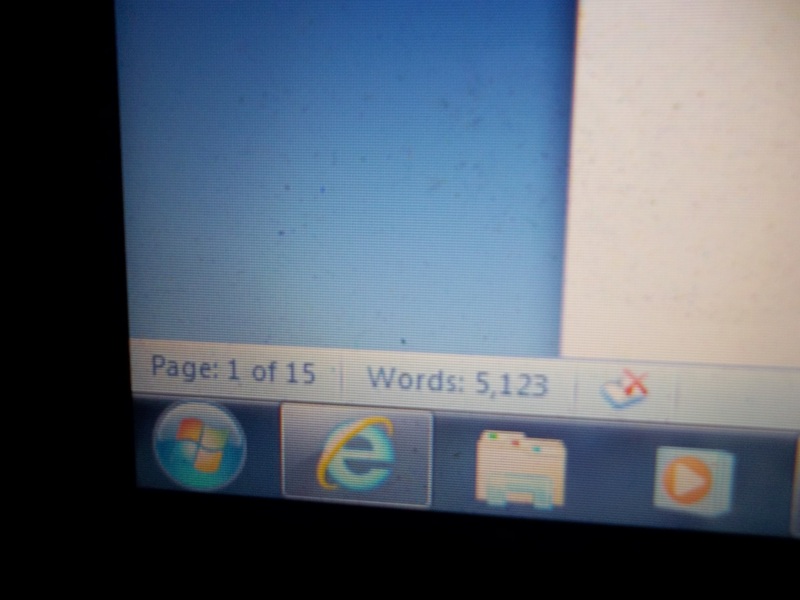 It’s been several thousand words; I know that much. It also would be interesting to know how many words I’ve written in the last week, or the last month, or the semester, or my entire life. And I wonder how much I’ve written if I were also to count words that I then deleted. It would be a really enormous number. Results are in. 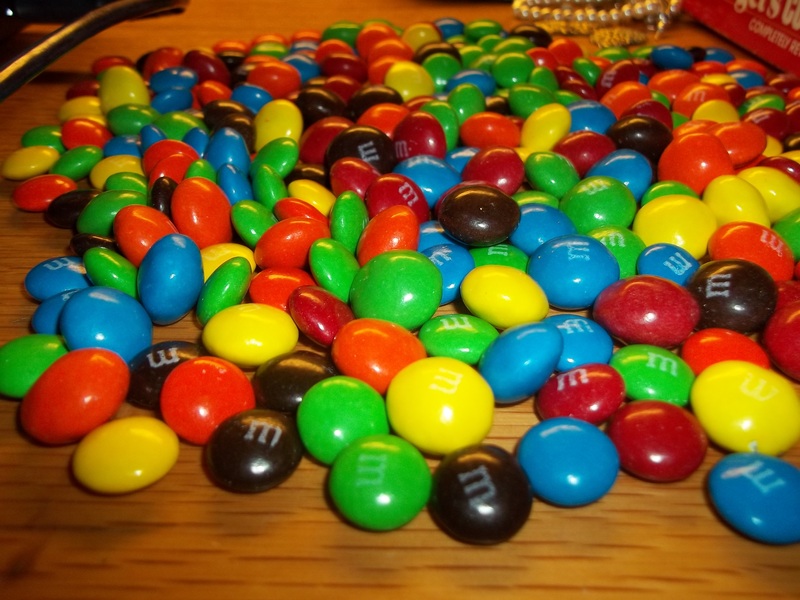 If life was fair, each color of M&Ms would be at approximately 16.66 %. As the accompanying list shows, this was not quite the way it worked out. The order of colors here is important, by the way, because they’re in order of how much I like them. 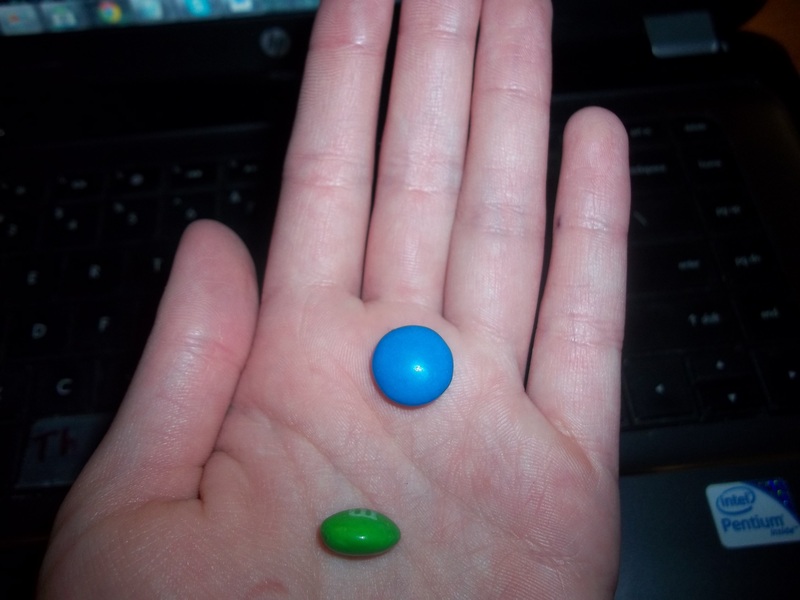 Blue M&Ms are the awesomest and orange are the least awesome. As you can see, the two colors that I like the least were over-represented. This is unfair. I believe in equal rights for all M&M colors. Now, if I’m ever in a situation where such a topic might come up, I can say that I once spent an entire night counting M&Ms. Ah, college. Surely I shall look back upon these days with nostalgia for as long as I live. So much for watching the sunrise this morning. 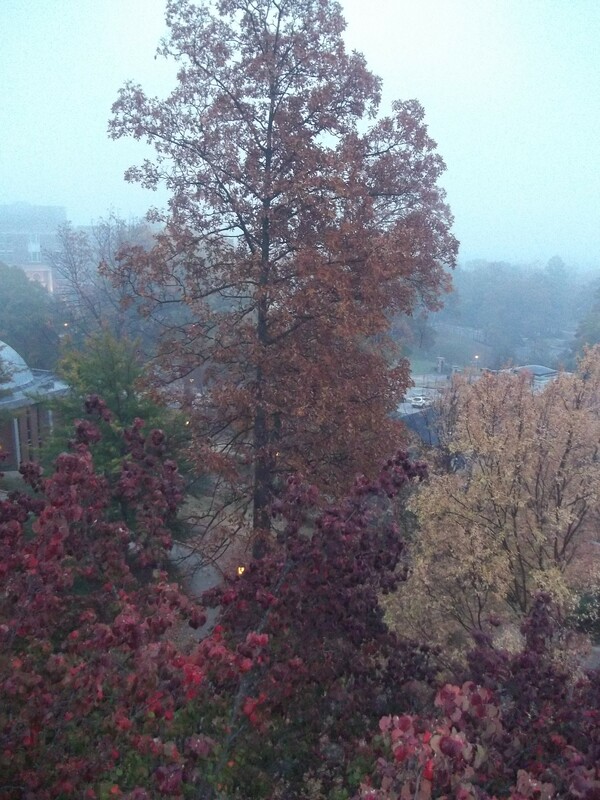 But here is some lovely fog. I think I’m going to take a shower relatively soon so that I don’t miss the sunrise. There’s no point in staying up all night if you don’t get to see the sunrise. Goodness gracious, self, this paper is terrible! What the camaduka were you doing all night? Once upon a time, I didn’t drink coffee. I’m not sure if my parents would have allowed me to drink coffee before I was in college, even if I had wanted to, but at that time, I assumed that I wouldn’t like it anyway. I thought it smelled pretty gross. During my freshman year of college, I still didn’t drink coffee. It didn’t really seem necessary. I’m sort of a morning person, so it wasn’t too great of a hardship for me to get up in the morning and go to classes without consuming caffeine. At that time, though, my class schedule wasn’t so intense; I was only taking a slight overload. In fact, I vaguely remember having free time as a freshman; not just a little bit during the summer and occasionally late on weekend nights, but almost on a daily basis. And I slept for about six or seven hours a night, which seems excessive compared to the amount of sleep I have gotten for the last couple years. Coffee was not vital for survival at the time. I began drinking coffee on September 15, 2010. (Or maybe it was the 8th, I don’t remember for sure, but I think it was the 15th) ‘Twas a Wednesday morning early in my sophomore year, and I knew that Wednesdays were going to be tough that semester. I had an 8:00 class, a 9:30 class, an 11:00 class, a 12:30 class, a 2:00 class, a 3:30 class, and then work from five to nine. It was the first time I’d ever had a schedule that full, and even though it was only that way once a week, I figured that drastic measures were necessary. Thus, I declared Wednesday to be coffee day. 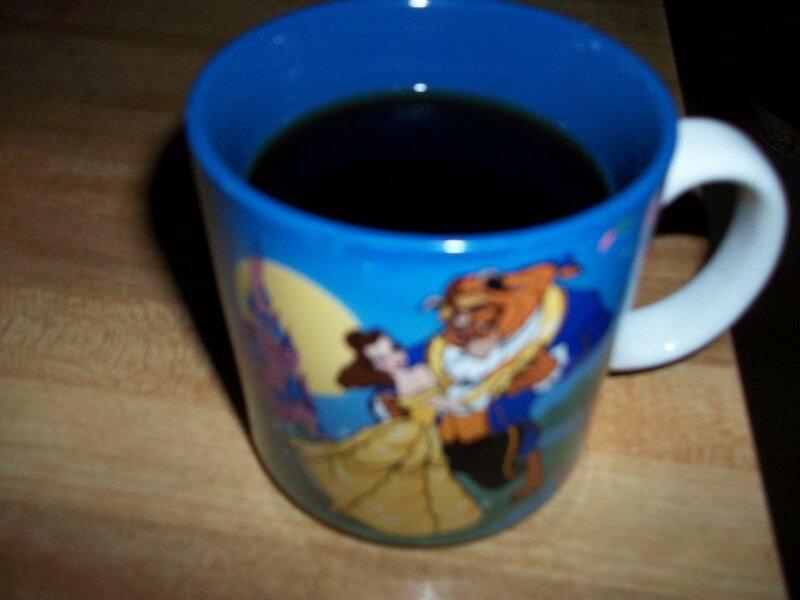 I drink coffee out of this mug not because of any particular fondness for Disney, but because I’ve had this mug since I was very little and it has many memories for me. In the cafeteria that morning, I found my way to the coffee machines and stared in confusion at the multiple flavors. The one that was decaf was quite clearly not what I wanted, but I wasn’t sure about any of the others. They all had names like ‘Guatemala Roast’ and ‘Rainforest Blend’, but I couldn’t see one labeled ‘Just Regular Coffee’, which was what I wanted. For the record, if I ever open my own coffee shop, there will absolutely be a kind of coffee named ‘Just Regular Coffee’, and I expect that it would be one of the most popular products. Anyway, I eventually chose one at random, put a bunch of it in a cup, added an inordinate amount of powdered creamer and sugar, (although I discovered shortly afterward that I prefer black coffee) and then drank it. The first sip tasted a little strange and not really very good. The second sip tasted much better. On the third sip, I completely and permanently fell in love with coffee. The story behind this picture is much too long and weird to tell in a caption, which is too bad, because it is a funny story. Thus, Wednesday became my favorite day of the week. I lived my life in a constant countdown to 7:00 on Wednesday morning. In fact, I came to dread Thursdays and Fridays because on those days, the following Wednesday seemed so far away. Fridays in particular were not a lot of fun, because by that time, I was tired and totally ready for the week to be over. In my 8:00 AM class, it was difficult to focus. The solution was obvious. Friday became coffee day also. At the beginning of the following spring semester, I decided that Monday also seemed like a good sort of day to have coffee, and after I got my own coffee machine last summer, it only seemed logical to throw Sundays, Tuesdays, Thursdays, and Saturdays in for good measure. Now, every day is coffee day in my life, and it’s pretty awesome. Upon returning to my dorm room at 10:00, I discovered that my to-do list for the rest of the night was still too long for me to accomplish everything on it. After pondering the best course of action, I came to the conclusion that the most flexible of the tasks on said list was ‘sleep’. Unfortunately, it would have also been the easiest one to accomplish. Oh, well. There will always be time for that tomorrow. Incidentally, I am greatly enjoying the sound coming from my coffee maker. That machine and I are good friends. The cool thing about being awake in the middle of the night on the last day of the month is that I get to turn the calendar page at exactly midnight. It’s kind of like New Year’s Day, except that it isn’t a New Year. On an unrelated note, I think I made my coffee too strong. The first indication of that was the fact that when I drank it, it tasted really strong. The second indication was the fact that, when I spilled some on the very edge of my desk, instead of dripping the way liquids generally do, it slowly oozed. In my experience, coffee is supposed to drip, not ooze. On a positive note, I am finally making significant progress on my final paper for my Chaucer class. Since it is due in about thirty-one hours, I’d be in trouble if I wasn’t getting a lot done tonight, but it’s still exciting to realize that someday, I actually will be done with this paper. On a less positive note, no matter how frequently I refresh the screen, nobody else has made a move in any of my ongoing internet chess games. If other people were making moves, that would provide me with the ideal way to take a break. It only takes a minute to make a chess move, but it requires just the right amount of mental energy to help me refocus my brain, enabling me to better continue my homework. Plus, if I win, it increases morale and motivation levels. But since none of my current opponents are cool enough to be available to play middle-of-the-night internet correspondence chess with me, I must rely on coffee for my morale and motivation, even though it is starting to give me a stomachache and my brain is being weird. Fortunately, it is accomplishing its purpose in that I am not even slightly tired, despite the fact that I was exhausted five hours ago. Okay, now I’m tired, and I’m also almost out of coffee. At this point, though, it’s a little too late to go to bed because I have to get up pretty soon anyway. I really don’t feel like doing any more homework, though. I’m getting tired of words. Maybe I should use my calculus homework to take a break from writing papers. My life would be so much easier right now if I knew what the Taylor series for e^t cos(t) is, but unfortunately, I have no idea. I do, however, know what the Taylor series for ln(1-2y) is, which I think is a pretty significant accomplishment. Incidentally, fun fact: In Chicago in the 1880s, the people of German ancestry didn’t get along with the people of English ancestry because Germans like to drink beer and English like to drink whiskey, and the Germans thought that was an unforgivable cultural difference. I am now out of coffee, and after having consumed nearly a week’s worth of coffee in less than seven hours, I don’t think I want any more anyway. Now, I guess I’ll take a shower and get ready to go to class. I have to get up early so that I can finish the homework that I didn’t finish during the night because the night just isn’t long enough. Life is tough this time of the semester.